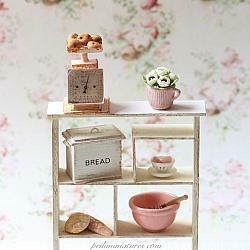 A beautiful dollhouse miniature vintage kitchen scale in 1/12 dollhouse miniature scale. 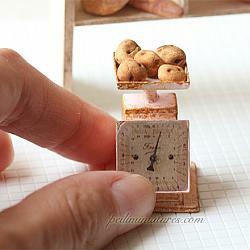 Entirely handmade by me, I spend several hours making this adorable realistic looking kitchen scale. I hope you love this as much as I enjoyed making it come to life! Please note that this purchase is only for the pink vintage kitchen scale. 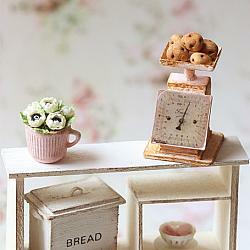 Other accessories such as the potatoes, background props and flowers are NOT included in the purchase. This item will be shipped via registered mail that comes with a tracking number. This is an adult dollhouse miniature collectible item and is not suitable for young children. This is entirely handcrafted by myself without the use of any machines. There are imperfections as it is handmade. I can make this in other colors. Please contact me for a custom listing.